Chest tube insertion can be practiced at the left mid-axillary site, at the 4th and 5th intercostal spaces. VitalSim allows for increased functionality including creating, editing and running of scenarios. 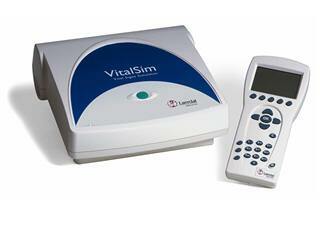 VitalSim™ Unit required for operation. Sold separately. See part # 200-10001. Availability: Usually Ships Within 2-6 weeks. 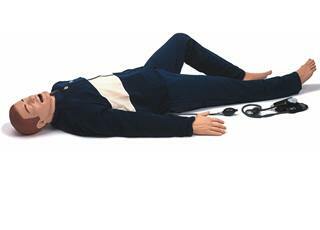 The VitalSim Vital Signs Simulator is the heart of Laerdal’s VitalSim product line. When connected to VitalSim-enabled manikins and skills trainers,VitalSim simulates ECGs, heart sounds, fetal heart sounds, breath sounds, bowel sounds, blood pressure and pulses. VitalSim also allows instructors to run pre-programmed scenarios as well as write their own custom scenarios to meet their specific learning objectives. Data logging and download functions provide valuable information for use in performance assessment and debriefing. Product Includes: Control Unit including Battery Case and Batteries (6), Remote Control including Batteries (4), Operating Device to Control Unit Cable, USB Cable for connection to PC, AC Adapter, Software CD, Carry Case and Directions for Use.